Subscribe to our mailing list to receive the blog first, and to learn all the latest 6/8 news! 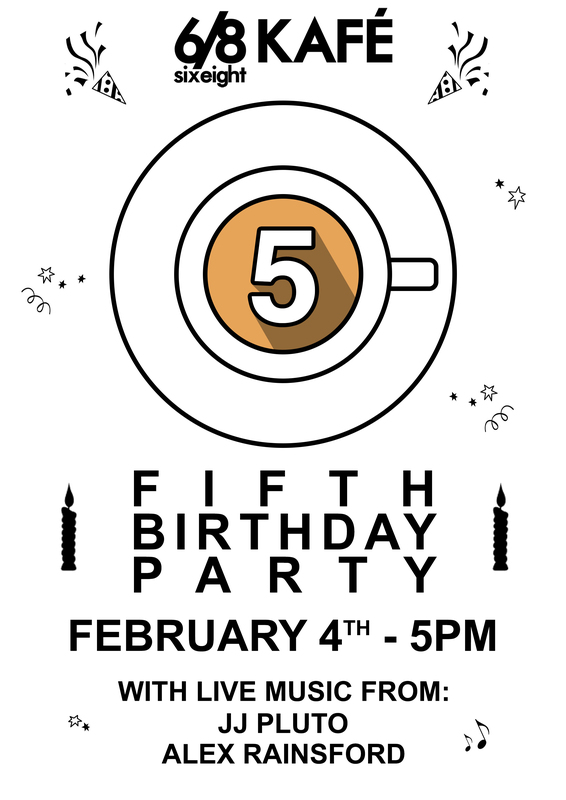 Five years ago on a cold dark February morning, four people opened the doors to a small independent coffee shop in Birmingham City Centre. None of the people concerned had ever worked in a coffee shop. There was no sign, no food and not even a fridge. Just a coffee machine and a cookie jar. We would like to thank everybody who helped us on our journey and got us where we are now. It’s been five years of ups and downs, from constant challenges to national highs. We would love to celebrate this event with you, whether you have been a customer, a supplier, a staff member, a friendly competitor or even a partner of someone who has worked here. We wouldn’t have been here without you, so please drop by at Temple Row between 5:00pm and 10:00pm for some live music and great coffee. As we said last week, coffee fruit is much like a cherry and grows on a plant/bush. 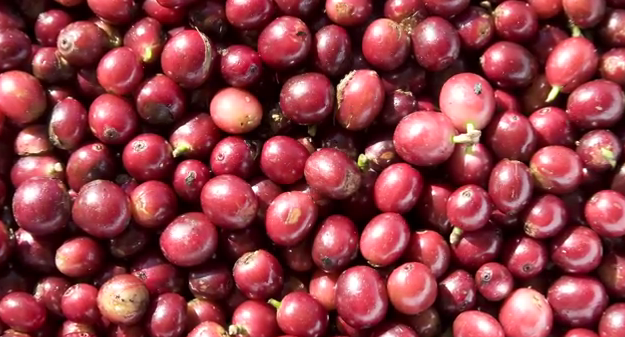 So how do we turn a coffee cherry into a drink? First the (coffee) cherry must be picked. There are machines that can do this, however there are two problems with using a machine – firstly coffee needs to be picked when it is ripe and bright red in colour and a machine can not distinguish between ripe and unripe fruit so this affects the quality of the cup. Secondly the best coffee is grown at high altitude, usually clinging to the side of a steep hill – machines don’t work in these conditions! Because of this, the best way to pick coffee is by hand. This is much slower and requires pickers to have the skill of picking only the ripe fruit and thus is more expensive, but it’s worth it. After the fruit has been picked it is sorted to make sure no unripe fruit has been picked, then the coffee must be dried and the fruit must be removed from the seed (the bean). At this stage the coffee beans will be ready to be shipped to coffee roasters. There are two main ‘processes’ for drying the coffee and removing fruit which are called the natural process and the washed process. Firstly we will look at natural process. This is the ‘low tech’ method of processing. 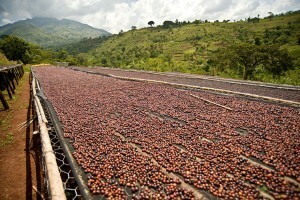 Coffee fruit is laid in a thin layer on brick or concrete patios and left to dry; sometimes raised drying tables are used to allow better air circulation. The coffee must be carefully and regularly turned so that it can dry evenly. This is done either by hand or using special rakes. After the coffee has dried, the fruit is mechanically removed, leaving the ‘green’ coffee ready to be shipped to a roaster. The natural process adds an innate fruity flavour to coffees that is quite controversial: some enjoy the often blueberry or tropical fruit flavour, while others see the process as a taint on the true flavour of the coffee. of a bush), and the coffee ‘bean’ is actually the seed of the fruit. So where does coffee come from? this through mutation or genetic selection. A great way to think about coffee is that it is similar to apples. they are also very different; coffee is the same. contains two popular varieties: Bourbon and Caturra. sweeter, making it a desirable coffee. it is high yielding and has generally high cup quality. produce coffee beans that we recognise. 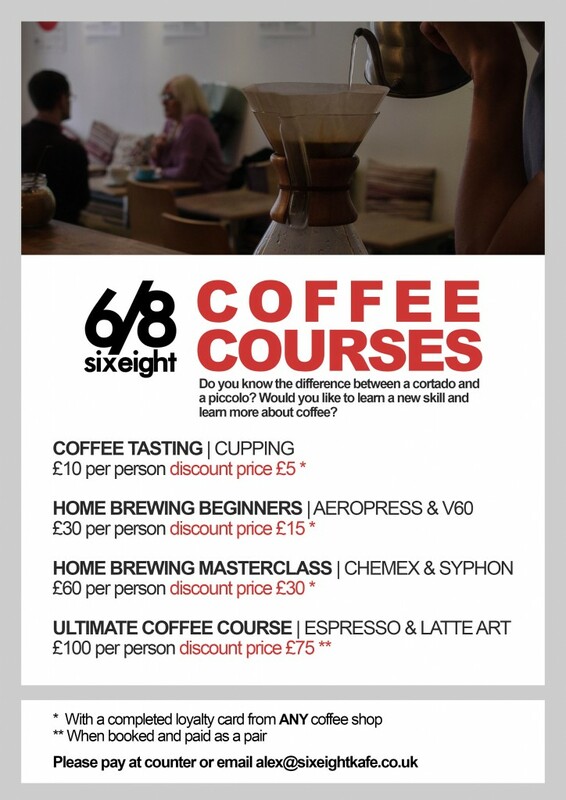 Following on from last week, we would like to tell you about the second of our coffee courses; our ‘home brew’ course. We call this the home brew course, but don’t be fooled. ‘Home brewing’ isn’t amateur at all, and we can teach you to get excellent results! We are confident that this course will be able to teach you to make better coffee than a lot of the coffee shops out there! On the course we’ll be teaching you how to make coffee using two world class brewing methods: the Aeropress and the pour over. We will be using a ‘Kalita Wave’ brewer for the pour over method, and you can check out our past blog posts about both methods to get a little taster to whet your appetite. So again, we invite you to join us for one of our regular courses, treat your self for Christmas and have great coffee at home in the new year! Why not treat someone else for Christmas… then they can make your coffee in the new year! We’ve now got gift vouchers for sale and we’re also open on Christmas Eve if you’re still panicking on the present buying front. We have some freshly roasted bags of coffee direct from Has Bean too, along with plenty of devices to brew at home. As we said a few weeks ago we have changed our house blend to Has Bean’s ‘Jailbreak.’ For those who don’t know, Has Bean is a world renowned coffee roaster based in Stafford who have previously roasted coffee used to win The World Barista Championship. … that’s a lot of information right? Well we don’t want to overwhelm you with information, so lets just look a little at one of the three coffees that make up the blend. El Salvador, Argentina Estate, Washed, Bourbon. This information really is the tip of the iceberg, with a quality roaster like Has Bean you get ALL the information – like what the farmers wife’s (or husband’s) name is. So we will dig a little further into the El Salvador, Argentina Estate, Washed, Bourbon. Cupping is a structured method of tasting coffees to compare them to one another. Bellow are Has Bean’s cupping scores when grading the coffee. Nothing scoring below 80 on a cupping table will make it into the specialty coffee market. – Coffee cuppings (tasting sessions) are available at 6/8, plug, plug. There is a lot more information about this coffee on Has Bean’s website, including Steve Leighton’s ‘In My Mug’ video about the coffee, it’s interesting stuff. Remember, this is one of the three coffees that make up the current Jailbreak blend. That should be plenty of reading and watching for you until next time! If you need more you can also look up the other coffee’s in the blend on Has Bean’s website. Sorry, can’t provide any provenance for the 1% magic. The clever dripper is a brewer that has things in common with a number of brewers, but offers it’s own unique package. Jailbreak is back! We’re now serving up this amazing espresso blend from Has Bean Coffee again. Come into either of our shops to try it out! 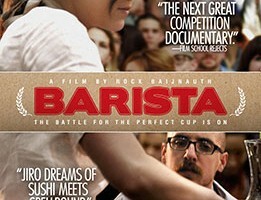 Last week saw the release of the film ‘Barista.’ The film follows the USA Barista Championship. Stay with me, yes there is a film and yes there are competitions! The film is a great window into a world of pure coffee geekage and it’s entertaining and it’s informative and it’s funny – what more could you want? !